The Sentinel Space Telescope in orbit around the Sun. Image courtesy of Ball Aerospace. The B612 Foundation is partnered with Ball Aerospace to build the Sentinel Infrared Space Telescope Mission. 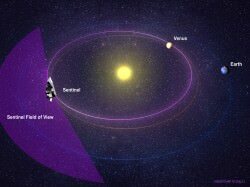 Once positioned in solar orbit closer to the Sun from Earth, Sentinel will look outwards in infrared to detect hundreds of thousands of as-yet unknown near-Earth objects over 140 meters in size. The privately-funded spacecraft is slated to launch in 2017-18 aboard a SpaceX Falcon 9 rocket. The event will be held at 6 p.m. PDT at the Museum of Flight in Seattle, WA. It is free to the public and the visualization will be made available online on the B612 Foundation website. Global Rural Urban Mapping Project came up with a figure of 3% of the planet is urban. Forgive my crude workings but I guess 26 kTs in 13 years would average out at a 0.6% chance of a city killer per year. Of course you can divide that by the number of cities in the world and your own chances of being hit by one are even smaller. We have known that the impact flux was 2x-3x the often accepted estimates since the end of the first phase of the MRO mission and its MOLA data, followed by LRO and GRAIL. All the data shows that Mars and the Moon have been impacted 3x the amount ordinary photo-geology indicates. Also the American DoD has been particularly recalcitrant in releasing its data on how often the planet experiences impacts. The sensors DoD uses to detect nuclear explosions also detects bolides passing through the atmosphere. But the data is classified at least TS-LSP. “Blind Luck”? Ahhh yes… the story of the lucky monkey and the falling coconut! From then on…. he watched the sky. Cool, yea, really fantastic article. I didn’t need to sleep tonight anyway… or ever again. Just don’t think about them. There… problem solved. Ahh, but of course we still have to develop the MEANS to “easily deflect them”. The technology is probably within our grasp already, but the willingness to expend the funds needed to develop something to intercept one or two of these per year is probably still several years and one catastrophe away. Once we learn of and can calculate precisely where on earth these asteroids will hit, and can determine that one is indeed going to affect an urban area, there will be much more willingness to spend the funds to do something about it. THAT number is much lower than one or two per year, so will not be nearly as expensive to deal with as opposed to the recent 26 in 13 years. One wonders where these interceptors might be stationed. We could just keep them here in some big warehouse, ready to blast into space when needed. This would greatly slow down the response time available to intercept any objects that were very close when detected. We might also “station” a few in various orbits around the earth, out at about 11,000 miles away or better, perhaps half way out to geo-synchronous orbit where they would be available on demand to fire up again and be sent to intercept a threatening asteroid. We’re not told at what altitudes these explosions occurred. If they exploded at higher altitudes than Chelyabinsk, they’d be less damaging.